Revised and updated to include the behavioral sciences, the second edition of this introductory statistics book engages students with real-world examples and exercises. To the dismay of many social and behavioral science majors, successfully passing a statistics course in sociology, psychology, and most other social/behavioral science programs is required, and at many institutions statistics is becoming a university-wide requirement. In this newly revised text, the authors continue to make use of their proven stress-busting approach to teaching statistics to self-describe math phobic students. This book uses humorous examples and step-by-step presentations of statistical procedures to illustrate what are often complex and hard-to-grasp statistical concepts. 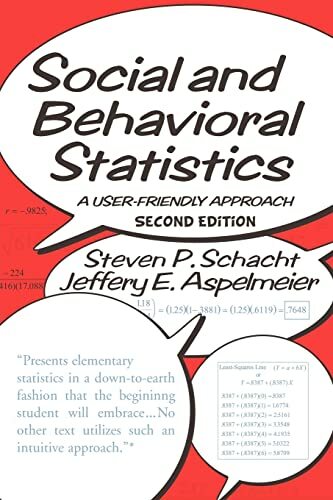 Students and instructors will find this text to be a helpful, easy to interpret and thoroughly comprehensive introduction to social and behavioral statistics. Perfect for social and behavioral sciences upper-level undergrads fearful of that required stats course. It uses stress-busting features like cartoons and real-world examples to illustrate what are often complex and hard-to-grasp statistical concepts. Includes the newest and most necessary tools for students to master statistical skills making handouts or additional books unnecessary and gives instructors and their students a compact and affordable main text for their introductory stats courses. The late Steven P. Schacht (1960-2003) was associate professor of sociology at State University of New York, Plattsburgh. Jeffery E. Aspelmeier is in the department of psychology at Radford University in Virginia.